A happy family with DHHL director Jobie Masagatani (left) and Gov. Ige at the Kaka’ina lot selection in Waimanalo. 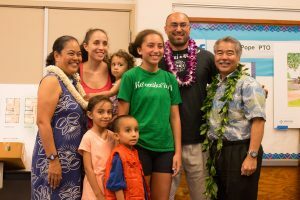 It was a day for celebrating at a ceremony last month as dozens of families chose Hawaiian homestead lots in the Kaka‘ina subdivision in Waimānalo. The 44 lots are part of the most recent Department of Hawaiian Home Lands project. A sister subdivision finished last summer is also home to 45 Native Hawaiian families.